Submitted by dave on February 13, 2007 - 3:18am. Galveston Daily News / October 6, 1892. A BLOODY DAY AT COFFEYVILLE FOR BOTH SIDES. The Place Strewed With Corpses of Robbers, Officers and Citizens -- The Plot and the Battle Described. COFFEYVILLE, Kan., Oct. 5. -- The Dalton gang has been exterminated -- wiped off the face of the earth. They were to-day shot down, but not until four citizens of this place yielded up their lives in the work of extermination. Six of the gang rode into town this morning and robbed two banks. The raid became known to the officers of the law, and when the bandits attempted to escape they were attacked by the marshal's posse. In the battle which ensued four of the desperadoes were killed outright, and one so fatally wounded that he has since died. The other escaped but is being hotly pursued. Grant Dalton, desperado, shot through the heart. Emmett Dalton, desperado, shot through the left side. Joseph Evans, desperado, shot through the head. John Moore, "Texas Jack," desperado, shot through the head. T. A. Reynolds, of the attacking party, has a wound in the right breast, but it is not considered necessarily dangerous. It was rumored a month ago that the Dalton gang contemplated an immediate raid upon the banks of the city. Arrangements were made to give them a warm reception, and for over a week of patrol was maintained night and day to give warning of the gang's approach. The raid did not take place, and then came the report, from Deming, N. M., that United States officers had had a battle with the bandits and three bandits had been killed. This report is believed here to have been circulated by the Daltons themselves, their intention being to divert attention from their real intentions and to lull the people of the town into a sense of security. The people, however, were not so easily deceived, and when the report of the disaster to the gang in New Mexico was denied vigilance was renewed. Still the expected raid was not made; finally the patrol was withdrawn last Saturday, although every stranger was carefully scrutinized as soon as he appeared on the streets. It was 9 o'clock this morning when the Dalton gang rode into town. They came in two squads of three each, and passing through the unfrequented part of town into the valley in the rear of the First national bank quickly tied their horses and without losing a moment's time proceeded to their attack upon the banks. Robert Dalton, the notorious leader of the gang, and Emmett, his brother, went to the First national bank, the other four, under the leadership of "Texas Jack," or John Moore, going to the private bank of C. M. Congdon & Co. Meantime an alarm had already been given. The Dalton boys were born and bred in this vicinity, and were well known to nearly every man, woman and child in town. In their progress through town, they had been recognized. City Marshal Connelly was quickly notified of their arrival, and almost before the bandits had entered the bank he was collecting a posse to capture them if possible or kill them if necessary. He ran first to the livery stable of Jim Spears, a dead shot with the Winchester and a valuable man in any fight. Then he summoned George Cubine, a merchant; Charles Brown, a shoemaker; John Cox, express agent, and other citizens who could be conveniently reached. Stationing them about the square, which both of the banks faced, he hastened to augment the posse by summoning other citizens for impromptu police duty. While Marshal Connelly was collecting his forces the bandits, all ignorant of their being laid for, were proceeding deliberately with their work of robbing the banks. Texas Jack's band entered Congdon's bank, and with Winchesters leveled at Cashier Ball and Teller Carpenter ordered them to throw up their hands. Then Texas Jack searched them for weapons, while the other three desperadoes kept them covered with rifles. Finding that he was unarmed, Cashier Ball was ordered to open the safe. The cashier explained that the safe's door was controlled by a time lock and could not by any means short of dynamite be opened before its time was up, which would be 10 o'clock, or in about twenty minutes. "We will wait," said the leader, as he sat down at the cashier's desk. "How about the money drawers? " he asked, suddenly, and jumping up, he walked around to the cages of the paying and receiving tellers and taking the money, amounting in all to less than $2300, dumped it into a flour sack with which he was supplied and again sat down while the time lock slowly ticked off the seconds and the hands of the clock hardly moved towards the hour of ten. Bob and Emmett Dalton, meanwhile, were having better luck at the First national bank. When they entered the bank, they found within it Cashier Ayers, his son, Albert Ayers, and Teller W. H. Sheppard, none of them armed, and with levelled revolvers the brother bandits intimidated them. Albert Ayers and Teller Sheppard were kept under the muzzle of Emmett Dalton's revolvers, while Bob Dalton forced Cashier Ayers to strip the safe vault and cash drawers of all the money contained in them and place it in a sack brought along for that purpose. Fearing to leave them behind lest they should give the alarm before the bandits should be able to mount their horses and escape, the desperadoes marched the officers of the bank out of the door with the intention of keeping them under guard, while they made their escape. The party made its appearance at the door of the bank just as Liveryman Spears and his companions of the marshal's posse took their positions in the square. When the Dalton Brothers saw armed men in the square they appreciated their peril on the instant, and leaving the bank officers on the steps of the bank building, they ran for their horses. As soon as they reached the sidewalk, Spears' rifle quickly came to position. An instant later, it spoke and Bob Dalton, the notorious leader of a notorious gang, fell in his tracks, dead. There was not a quiver of a muscle after he fell. The bullet struck him in the right temple, plowed through his brain and passed out just above the left eye. Emmett Dalton had the start of his brother, and before Spears could draw a bead on him he had dodged behind the corner of the bank, and was making time in the direction of the alley where the bandits had tied their horses. The shot which dropped Bob Dalton aroused Texas Jack's band in Congdon's bank, who were patiently waiting for the time lock of the safe to be sprung with the hour of 10. Running to the windows of the bank they saw their leader prostrate on the ground. Raising the rifles to their shoulders, they fired one volley out of the windows. Two men fell at the volley. Cashier Ayers fell on the steps of his bank shot through the groin. Shoemaker Crown [sic] of the attacking party in the square was shot through the body. He was quickly removed to his shop, but died just as he was carried within. The firing attracted the attention of Marshal Connelly, who was collecting more men for his posse, and with a few whom he had already gathered, he ran hurriedly to the scene of the conflict. After firing a volley from the windows of the bank the bandits, knowing their only safety lay in flight, attempted to escape. They ran from the bank, firing as they fled. The marshal's posse on the square, without organization of any kind, fired at the fleeing bandits, each man for himself. Spears's trusty Winchester spoke twice more in quick succession before the others of the posse could take aim, and Joseph Evans and Texas Jack fell dead, both shot through the head, making three dead bandits to his credit. In the general fusilade which followed Grant Dalton, one of the surviving members of Texas Jack's squad, Marshal Connelly, George Cubine and L. M. Baldwin, one of Congdon's clerks, who was out collecting when the attack was made, were mortally hit and died in the field. Allie Ogee, the only survivor of the band, succeeded in escaping to the alley where the horses were tied and, mounting the swiftest horse of the lot, fled south in the direction of the Indian territory. Emmett Dalton, who had escaped from the First national bank, had already reached the alley and safety, but had some trouble in getting mounted, and Allie Ogee had already made his escape before Emmett got fairly started. Several of the posse, anticipating that horses would be required, were already mounted and quickly pursued the escaping bandits. Emmett Dalton's horse was no match for the fresher animals of his pursuers. As the pursuers closed on him he turned suddenly in the saddle and fired upon his would-be captors. The latter answered with a volley and Emmett toppled from his horse, hard hit. He was brought back to the town and died late this afternoon. He made an anti-mortem statement, confessing to various crimes committed by the gang of which he was a member. Allie Ogee had about ten minutes' start of his pursuers, and was mounted on a swift horse. At 5 o'clock this evening he had not been captured. After the battle was over search was made for the money which the bandits had secured. It was found in the sacks where it had been placed by the robbers. One sack was found under the body of Bob Dalton, who had fallen dead upon it while escaping from the First national bank. The other was found tightly clinched in Texas Jack's hand. The money was restored to its rightful owners. The bodies of those of the attacking party who were killed were removed to their respective homes, while the bodies of the dead bandits were allowed to remain where they had fallen until the arrival of the coroner from Independence, who ordered them removed to the courthouse. There he held an inquest, the jury returning a verdict in accordance with the facts. The inquest over the bodies of the dead citizens will be postponed until the result of the pursuit of Allie Ogee is known. During the time the bodies remained in the square they were viewed by hundreds of people of this and surrounding towns, who, having heard of the tragedy, came in swarms to inspect the scene. The excitement was of the most intense character, and the fate of Allie Ogee, should he be captured, was determined by universal consent. He will be hanged. Other topics which attracted universal comment were the fulfillment of a prophesy that the Daltons would "die with their boots on," the peculiar fate which had decreed that they should die by the hands of their old friends in the vicinity of the place of their birth, and the excellent marksmanship of Liveryman Spears, who with three shots sent death to as many bandits. Indian Territory into Colorado, where he would sell them. He was joined soon by his brother, Grant Dalton. Their depredations became so frequent and troublesome that the cattlemen organized to drive them from the strip. A posse of cowboys formed for that purpose gave the Daltons a hard chase, finally losing them in the wilds of New Mexico. The next heard of the Daltons was in California, where they took to train and stage robbing. While robbing a stage there one of the passengers was killed in the attack. This spurred the officers to extraordinary efforts to effect the capture of the Dalton gang, and Grant Dalton was finally captured. While being taken to a place for safe keeping he was rescued by the other members of the gang, and the whole party finally escaping after being chased all over California and through part of Arizona. 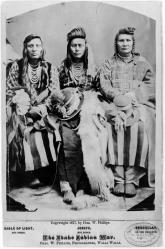 In the spring of 1889, the gang turned up again in the Indian Territory, and when Oklahoma was opened to settlement the Dalton boys secured a choice claim for their mother near Hennessey, where she still lives, supported by one of her sons. At the time of the opening Bob Dalton was a United States deputy marshal, being selected on account of his peculiar fitness to deal with desperate characters. After the opening he returned to his life of outlawry and he and Grant were then joined by their brother Emmett, the youngest of the brothers. They were at that time also joined by Texas Jack and soon gathered about them several desperate characters. It was then that the most successful period of the Daltons' career, from their standpoint, began. Their attention was first directed to the robbing of express trains, and they perpetrated many successful "hold-ups," the most noted of which are the robberies of the Santa Fe at Wharton, at Red Rock, of the Missouri Pacific at Adair, and of the 'Frisco near Vinita. The Wharton robbery was perhaps the most dramatic of all. The robbers went to Wharton on horseback, and entering the station there, asked the operator if the train was on time. He replied he would inquire, and was about to do so when one of the band, fearing the operator had recognized them, shot him dead upon the spot without a word of warning. When the train arrived it was held up after the regulation manner. In the pursuit of the robbers which followed, outlaw Ed Bryant was captured at Enid by Deputy United States Marshal Ed Short, known throughout the entire territory as a most brave officer. Short placed the captive in the baggage car of the Santa Fe train to take him to Guthrie. He had disarmed him, placing a brace of revolvers on a convenient trunk, and placed the desperado in irons. When the train reached Adair Short disembarked to send a telegraphic message. When he re-entered the car Bryant had secured one of his weapons and holding it in his manacled hands fired and fatally wounded Short. The officer, however, had strength to raise a Winchester and put four bullets into Bryant's body, expiring as he pulled the trigger the last time. There were no fatalities attending the Red Rock robbery, but the Adair robbery resulted in the deaths of two men. The express car was guarded and a hot fight took place between the guards and the robbers. The place where the train was held up was in the midst of town. One stray bullet passed into the room of a physician, and striking him in the head, killed him instantly. Another physician, hearing firing, went in its direction and was also shot and killed. The last train robbery committed by the gang was that of the 'Frisco near Vinita. The amounts secured by the robbers in their various raids will probably never be known. It was very great, however, and has been estimated at $300,000. After the 'Frisco robbery, the Daltons seem to have diverted their attention to the robbery of banks. They rode into El Reno one day and attacked the only bank in town. The only person in the bank at the time was the wife of the president, who fainted at the first sight of the ugly revolvers. The bandits leisurely took all the money in sight and remounting their horses rode away. This raid netted them $10,000, which was such a severe blow to the bank it was forced into liquidation. To-day's was the next and last raid of the gang, and with it ended the existence of a band equalled only in the desperate character of its undertakings by the James and Younger bands. - Emmett Dalton, after being shot 23 times, did not die but recovered from his wounds, was sentenced to a life term in the penitentiary at Lansing, received a pardon after 14 years, made a career in California real estate and died in 1937 at the age of 66. - The eldest Dalton in the shootout was not Grant but Grat, short for Gratton. - The time lock at the Congdon (actually Condon) bank had already opened the vault earlier that morning, but the robbers didn't bother to try the door. - There is doubt as to whether there was actually a sixth robber who escaped, but in any case it was not Allie (or Ally, or Allee) Ogee, who wrote an indignant letter to the editor of the Coffeyville newspaper stating that he was employed at a meatpacking plant in Wichita at the time of the ill-fated raid.